Okay, so here's the deal: there are books about volcanoes erupting and meteorites hitting Earth and plane crashes where the survivors have to eat people—those are extraordinary crises. That's not what this book is about. I'm more the ordinary catastrophe type. 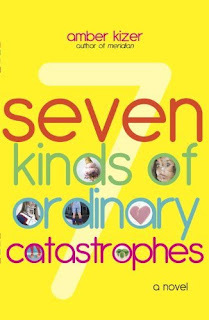 This second semester of my sophomore year, there are basically 7 KINDS OF ORDINARY CATASTROPHES: high school, boys, heartbreak, family, job, friends, and the future. Well, I guess everyone's life is full of ordinary catastrophes. These are mine. Hi, I'm Gert Garibaldi. Welcome to my crazy life. I can't think of a single reason why this book is not been talked about and reviewed throughout the blogoverse, therefore falling off the radar. 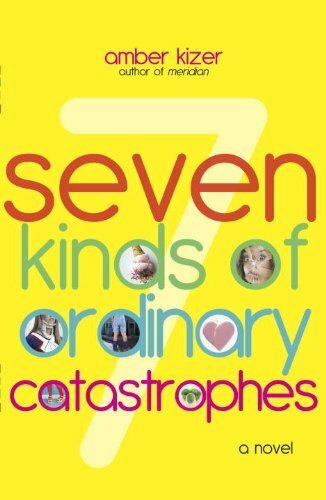 I truly believe that 7 Kinds... is a hidden gem that everyone has to discover and sink their teeth into! 7 Kinds... is about a 16 year old, Gert, who narrates the everyday problems of her teenage life, all the while trying to make some sense out of the craziness that is boys, friends and family.I found myself relating to Gert on many occasions. Not so much to her sometimes over-the-top reaction to things, which I guess were used to serve a comedic purpose, but more to her mindset and the way she viewed and assessed different situations. I was thinking "Exactly!" and "That's right!" while reading through her passing judgement on things we all consider wrong, but few have the guts and required "nerve" to say it. Her friends were very likeable as well, despite being so different from Gert and from one another.Also, I caught myself laughing out loud at so many parts in the books, it's ridiculous! All due to Kizer's amazing sense of humor! However, I soon discovered that 7 Kinds... had another side to it.Recently, my dad went through something awful, health-wise. The whole family was devastated and completely dumbfounded, seeing that my dad is vigor and health personified. What happened with Gert's dad in 7 Kinds... hit too close to home for me and touched me beyond words. It is amazing how you can go all "Ugh, the 'rents are driving me insane" and talk semi-crap about them one minute, and be totally overwhelmed and left aghast the next. You go on in your life thinking everything's for granted and taking everything lightly and then suddenly something happens and then it hits you. Hard and without mercy. What I went through with my dad this summer was a very sad and terrible situation but also a huge eye-opener for me and I was glad to see that Gert handled it exactly the same way, with more maturity than I ever had at the age of 16. Holy-Mother-of-Awesome-Books, 7 Kinds... was brilliant! It's a wonderful journey through adolescence, suitable for all ages!Highly recommended to fans of "Confessions Of Georgia Nicolson" series.